We are open for guests when courses and retreats are taking place. All guests must have a prior booking. Read our Update to find out more details about what's happening at Origins and Coorain. You can subscribe to our mailing list to get the Update e-mailed to you. < origins@iinet.net.au > unless otherwise stated. This calendar may be added to or changed during the course of the year as new courses or events come on stream. This is a very exciting new venture for us whose time has come! We are getting a wonderful response and positions are rapidly filling up. There is a diverse range of arts and interests happening: visual, literary, movement and music. The wedding of art and sustainable principles and actions for peace and mindfulness is a marriage for the sake of us all. From 9am to 10am the Balingup Yoga Group is holding weekly yoga classes in the rotunda. Classes are by donation. Check their facebook page for more information. As well as Beth's class at 9am on Mondays, we also have Lauren teaching a class at 10:30 on Thursday, and Adam teaching a class at 4pm on Tuesdays. All these three wonderful people are great Yoga teachers with their own method for creating a healthy body/mind. Join us for morning mindfulness on Tuesday, Wednesday, and Thursday mornings at 9am until 9:45am in the rotunda at Origins. There have recently been two private retreats happen at Tusita, a cabin/studio facility near Coorain. If you are interested in private retreat, please contact the Origins office origins@iinet.net.au Anyone doing private retreat should have some experience of Origins Centre and our general protocols. The centre relies on a culture of mutual respect and support and has done for 35 years. It is joy to provide the centre on a long term basis, as best we can. Your support in maintaining a well kept place and a friendly, helpful culture are, of course, what makes it all happen as well. Together we make Origins what it is. We are creating and rehearsing spoken word plainsong on the theme of mindfulness. Plainsong is an ancient form of human culture, practiced worldwide. One of its main uses for us is in the sharing of vital attitudes and understandings that inspire and direct us toward a common good. We aim to perform at Festival of Voice in Denmark at the end of May. Sun. 20th January: 10:30am – 12noon at Yogalife, 2/64 Spencer St., Bunbury. Mindfulness for 6-12 yrs old and their parent/guardian. This is gentle, helpful and non invasive way of supporting calm, resilience and worth. 5th Feb: 7pm - 9.30pm at Origins Centre. NEW MOON WOMEN'S GROUP with Chrissy. Kindy is at the heart of Origins. It includes from pregnant til 4yrs old, though older kids are welcome too. The 10am kids’ secular service in the rotunda is especially for the littlies. Bring some food to share and check Kindy out on our fb site. 9th & 10th Feb: MINDFULNESS AND NATURE with Ian Hackett. This weekend explore traditional mindfulness and the appreciation of ecology and the natural landscape. Schedule and more info to be announced. Kerry is a successful illustrator who will be doing an Artist Residence at Origins during Feb. Contact Lachlan on lachlan.origins@gmail.com if you would like to attend. SPOKEN WORD/PLAINSONG. We will choose a theme and begin composing and rehearsing. Sat. 23rd & Sun 24th Feb: 9:30 til noon at Coorain. There is a potluck lunch on Saturday. PLAINSONG with Chime. We are working on a song that expresses the ideas and aspirations of mindfulness practice. Workshop continues from Jan. 9th. People can join in for the first time but, if the work appeals, then we need consistency. Thurs 28th Feb: 6 - 7.30pm at Origins Centre. BODY MANTRA YOGA with Chris Newell. Every Wednesday in March and the first week in April: 5:30-7pm The first Philosophers Lecture series with Sholto. Sat. 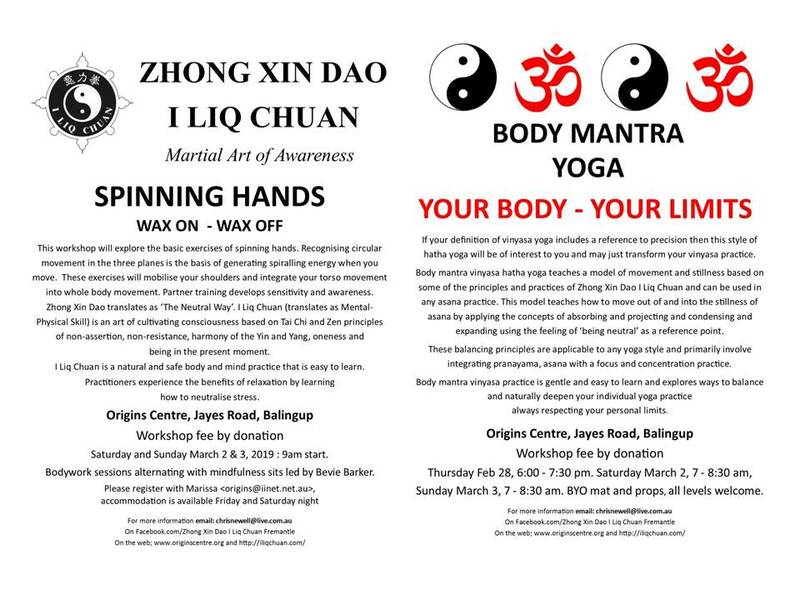 2nd & 3rd March: 9am - I LIQ CHUAN MOVEMENT with Chris Newell and SETTING UP MINDFULNESS with Bevie Barker. Sat. 2nd March: 3:30 – 5:30PM at Yoga Moves, Shenton Park. SPOKEN WORD/ PLAINSONG on the diverse expressions of compassion. We continue toward a performance piece for the Festival of Song in Denmark. 9th & 10th March: MINDFULNESS AND NATURE with Ian Hackett. This gentle approach to body healing through careful attention and consideration. Bevie is a Feldenkrais practitioner. 23rd & 24th March: 9:30 am- 12noon at Coorain with potluck lunch afterward. 30th & 31st March: at Origins Centre. POETRY AND THE ELEMENTS weekend with Jaya. 3rd April: Kindy at Origins Centre with Anne and others. Kindy is mainly focussed on pregnant til 4yrs old but older children re most welcome too. OC is a great adventure playground. Sat. 6th April: 3:30pm at Yoga Moves, Shenton Park - Following on from his talk on Refuge in March Chime will speak about Purification as the second of the four parts of the Foundation Work [Ngondro] in Tibetan Buddhism. He will be presenting it in a secular form, open to us all, and yes, if you missed the first one, you can still come, as each of the parts is a practice on its own. These Tibetan symbolic teachings have deep roots in human culture. This teaching celebrates the potential to live a more enlightened life, present in all people. NAMGYALMA is called the womb of all awakening; the mother of all buddhas. 7th -14th April: Healing Gods and Goddesses Archetypes Retreat with Mira Riddiford. Explore some of the archetypal themes of western culture into the depth of human nature and our place in the living world. Click here for more info. 23rd,24,25 April 9am mindfulness as above. 19th April, 6:30 til 7:45pm MIndful Men with Ian Hackett. An intensive two day workshop with craft distiller of aromatics, Jill Mulvaney from Alembics NZ. Learn about the ancient and enduring art of distillation using handmade Portuguese copper stills and modern stainless steel styles. Respectfully harness the unique, native plant power of Australian aromatics using a wide variety of plant extraction techniques. Accommodation is available at Origins. Sat. 4th May: 3:30pm at Yoga Moves, Shenton Park - Class and discussion on generosity with reference to 'Mandala Offering' practice from the Karma Kagyu school of Tibetan Buddhism. This teaching is about giving, receiving and sharing. 11th & 12th May: MINDFULNESS AND NATURE with Ian Hackett. OPEN FLOOR MOVEMENT with Jamie Howell. This is a conscious dance practice that is well established in the realm of movement teaching. This will be a good way to enter the May retreat. Jamie will be attending and may do extra early morning classes as well. Anne is a potter and mindfulness teacher who unites making, touch the earth and mindfulness practice. Catherine has run these retreats for women for some time. Details will be announced soon. Mindfulness and Nature retreat with Ian Hackett, from Tig-le, Margaret River. Sat. 6th July: 3:30pm at Yoga Moves, Shenton Park Talk on the the diverse pathways of transmission, related to the teaching of 'Transmission Yoga'. 6th & 7th July at Origins Centre. POETRY AND THE ELEMENTS weekend with Jaya. Anne is a skilled potter and teacher. Pottery is traditionally associated with the teaching of mindfulness. This wongkur involves the determination to protect all that live from indifference and carelessness and isolation. Every Tues., Wed., Thur. this month at 9am Mindfulness teaching, all welcome. 7th August: Kindy. 10am until mid afternoon with Anne and others. Potluck lunch. PRIVATE RETREAT with AA. This is an exclusive retreat through invitation only. August 20th: ORIGINS IS 36 YEARS OLD TODAY. The org. is actually three years older but the centre was established in 1983. 21st August: Kindy. 10am until mid afternoon with Anne and others. Potluck lunch. SPOKEN WORd RE. TRANSMISSION or the passing experience and wisdom from person to person, the lifeblood. This retreat is especially for people with some experience of practice. Everyone receives personal attention and each person settles into a suitable degree of practice. Instruction is meditation proper will be given as people get settled into the retreat. 22nd & 23rd September: I Liq Chuan Spinning Hands Workshop with Chris Newell. Sat. 5th October : 3:30 pm – 5pm at Yoga Moves, Shenton Park with Chime Shore Q&AEmphasis on the application of dharma to healing. THIS WOGKUR CELEBRATED 'UNIVERSAL MEDICINE' that is holistic and speaks to the whole of life. SPOKEN WORD RE RED CHENREZIG which talks about practice in the midst of intensity and passion. It seeks to empower the energy involved. Anne is an experienced potter, ceramicist and meditator. FAMILY RETREAT AND PEACE PAGODA DAY. This annual family get together is a wonderful time. There are many kids and families that are familiar with Origins and our Kindy so it’s a welcoming environment. A special Kindy session is held each day and there are lots of activities. On Sunday the 1st of December, we celebrate the 18th anniversary of our wonderful World Peace Pagoda. It is the 18th anniversary of this sacred site. Please come and bless the Pagoda with water, flowers and words. 11th December: Kindy 10am until mid afternoon with Anne and others. Potluck lunch. Sat.February 2nd @ 3:30pm -5:30pm - SPOKEN WORD/PLAINSONG on the diverse expressions of compassion. Sat. March 2nd: 3:30pm – 5:30pm - SPOKEN WORD/ PLAINSONG on the diverse expressions of compassion. We continue toward a performance piece for the Festival of Song in Denmark. Sat. April 6th: 3:30pm - SPOKEN WORD/PLAINSONG continues to rehearse the many hands of compassion based on 1000 armed Chenrezig. Sat. July 6th: 3:30pm - Talk and discussion on transmission and the dialogue of wisdom. WONGKUR of MEDICINE BUDDHA This wongkur celebrates Universal Medicine, the foundations of healing. Thank you for taking an interest in Origins Centre’s programs, courses and events. We endeavour to offer a well run, inclusive and kind place. The entire enterprise is run on the idea of mutual support and fair exchange. We are a not-for profit charity. Sign up below to receive monthly newsletters from the Origins Centre.